Fukushima, the six-reactor, bleeding nuclear power disaster station, now synonymous with, “You maniacs, you really did it, you blew it up!” is in need of some very intensive surgery. And the Japanese electrical company TEPCO cannot do the work anymore than a neighborhood kid with a cardboard playhouse can be hired to do the rewiring and plumbing of your dilapidated old home. Time for some adult assistance. Total Evacuation, Global Catastrophe. Let’s Not, Shall We? From the beginning of summer, when many of us tuned into this impending world-destroying disaster….to late fall….we, perhaps are at last seeing something resembling common sense, laced with a healthy dose of fearful respect for the encroaching disaster-in-the-making. 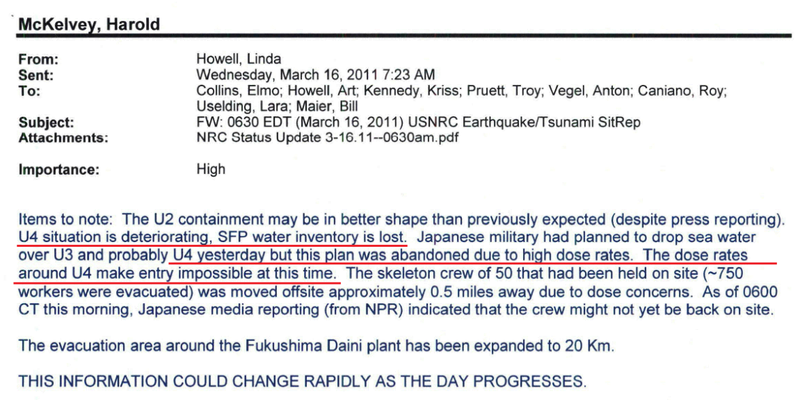 Much reported contaminated water problem at Fukushima Daiichi is overshadowing the Unit 4 crisis which is the most pressing global security issue. A mega earthquake surpassing intensity 6plus will make collapse the already wrecked building and the cooling pool containing ten times more cesium 137 than Chernobyl. There are in total 15093 fuel rods assemblies at the site. Frequent earthquakes continue to rattle the building. If the worst happens, the total evacuation will be imposed and it will be, as top scientists of the world warn, the beginning of a major global catastrophe. It is urgently needed to set up an international task force to assist Japan by deploying all possible means to reduce the risks of the imminent first unloading of spent fuel from the unit 4 under conditions of unprecedented complexity. This requires the establishment of a new system based on the full assumption of responsibilities by the Government of Japan. The enormous amount of funding needed must be totally supervised by the Government, not by TEPCO. This is the crisis of Japan as a nation, not the crisis of the management of TEPCO. One of the lessons of Fukushima should be the shift of the priority; from economy to life. The task force to be created under the new system, consisting of best selected experts, American and others, would provide, based on neutral assessment, adequate strategies for the stabilization of the Fukushima Daiichi. The world is pinning hopes on your historic role, symbolized by your vision “the world without nuclear weapons”. Say it loudly to everyone you know: Fukushima, Building 4. They cannot do this without total international cooperation, guidance, oversight and much military intervention. Really. You can’t do this TEPCO. Have some shame and humility, and step aside. Liam Scheff is author of “Official Stories,” because “official stories exist to protect officials.” He is host of the Energy Show on Truth Frequency Radio. “Official Stories and insidiously dangers these G.E. Plants are to Humanity to future generations. Yet it is all about profit, regardless what results in long term cancerous and human deformities. Further, I have difficulty understanding with the existing meltdowns, why don’t we have multiple geysers spewing absurd amounts of radioactivity into earth’s atmosphere already? I’d be curious to hear your take on both of these. I think it’s speculation, as he admits it is. If it’s true, and the fuel in Building 4 burned and disseminated into the sea, then we’ll know it by the massive death we see in the Pacific. I’ll try to parse through the documents he’s listed. I’ve tried before, I find it difficult to locate the firecracker or ‘smoking gun’ that makes it a certainty. I’ll keep looking. His argument is, however, annoying, because he also doesn’t provide the piece of evidence that I think clearly sums up the accusation. I also don’t know (and apparently no one else does either) what a release of radiation over the world’s largest ocean would look like in all specificity. In 2011, 2012, 2013? I suppose I’d expect higher Geiger readings. 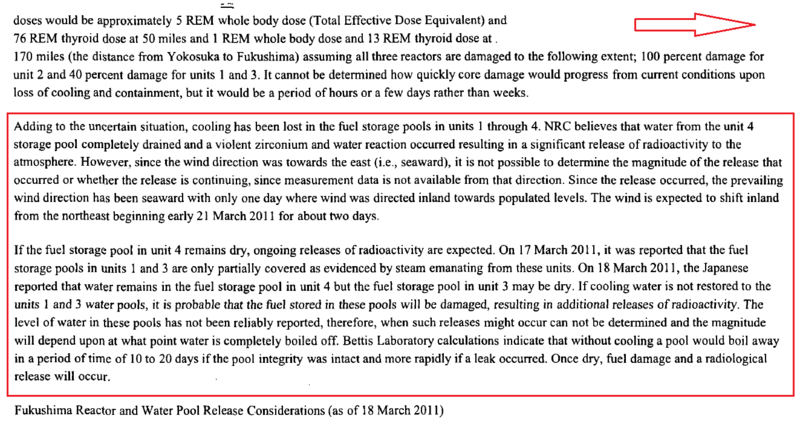 I’m sure TEPCO is covering up a great deal. That is known and apparent. But his accusation raises more questions: Why only building 4? There are six reactors. Why say that only 1 pool became uncovered? No one knows – but to say that there was a complete plutonium/uranium fire/meltdown in the emptied pool would seem to be contradicted by the many visuals and video of people and machines rebuilding the exterior structure. It’s a big, fat, awful “who knows.” I’d be happy to hear your thinking, research and data. I’ll continue to explore the documents. Thanks!